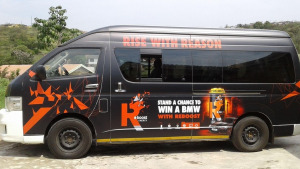 Transit Ads™ has implemented a geographically targeted campaign for Reboost Energy Drink, which aims to see the brand reaching its target market via two visible platforms – taxi branding and TRANSIT.TV™. "Taxi branding and TRANSIT.TV™ work seamlessly to ensure target audience reach and engagement. Commuters are targeted when they are experiencing high dwell time and are thus very receptive to advertising messages," says Hugh Wilson, GM sales: Transit Ads™. "Furthermore, this type of out-of-home branding impacts path to purchase because a retail environment is never more than a five-minutes walk from a taxi rank. So for a brand that wants to increase brand recall and product sales, advertising within the transit environment is key as it offers excellent return on investment," he adds. TRANSIT.TV™ features holding devices for news, weather, sports, and other information that is woven together by content segments. The content is interspersed with advertisements and packaged advertising messaging. The latest research from Kantar Millward brown shows that the channel delivers incremental reach above traditional television advertising, at a fraction of the cost. "The power and opportunity for advertising within a transit environment is to constantly remind consumers of a brand message. TRANSIT.TV™ is not a favourite channel viewed at home, it is a content-rich, relevant, and informative digital television channel that is viewed in a taxi, at a taxi rank, at a bus station, and at a train station," says Wilson. Wilson concludes, "Unlike traditional television, TRANSIT.TV™ cannot be turned off or paused. Content is live and present at times when consumers are experiencing high dwell times in a captive environment. Coupled to taxi branding, the TRANSIT.TV™ touchpoint works brilliantly in increasing brand affiliation and sales."